Human neural progenitor cells isolated under selective culture conditions from the developing human brain and directed through lineage differentiation. 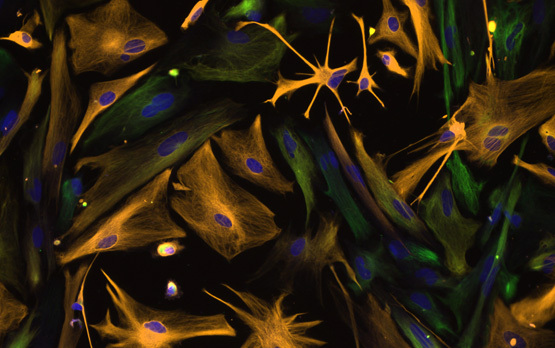 Neural progenitor cells are stained green; differentiated astrocytes are orange. Nuclei are stained blue. Image courtesy of the National Institute of Neurological Disorders and Stroke. Researchers at the University of California, San Diego School of Medicine have discovered that a well-known protein has a new function: It acts in a biological circuit to determine whether an immature neural cell remains in a stem-like state or proceeds to become a functional neuron. The findings, published in the February 13 online issue of Cell Reports, more fully illuminate a fundamental but still poorly understood cellular act – and may have significant implications for future development of new therapies for specific neurological disorders, including autism and schizophrenia. Postdoctoral fellow Chih-Hong Lou, working with principal investigator Miles F. Wilkinson, PhD, professor in the Department of Reproductive Medicine and a member of the UC San Diego Institute for Genomic Medicine, and other colleagues, discovered that this critical biological decision is controlled by UPF1, a protein essential for the nonsense-mediated RNA decay (NMD) pathway. NMD was previously established to have two broad roles. First, it is a quality control mechanism used by cells to eliminate faulty messenger RNA (mRNA) – molecules that help transcribe genetic information into the construction of proteins essential to life. Second, it degrades a specific group of normal mRNAs. The latter function of NMD has been hypothesized to be physiologically important, but until now it had not been clear whether this is the case. Wilkinson and colleagues discovered that in concert with a special class of RNAs called microRNA, UPF1 acts as a molecular switch to determine when immature (non-functional) neural cells differentiate into non-dividing (functional) neurons. Specifically, UPF1 triggers the decay of a particular mRNA that encodes for a protein in the TGF-? signaling pathway that promotes neural differentiation. By degrading that mRNA, the encoded protein fails to be produced and neural differentiation is prevented. Thus, Lou and colleagues identified for the first time a molecular circuit in which NMD acts to drive a normal biological response. NMD also promotes the decay of mRNAs encoding proliferation inhibitors, which Wilkinson said may explain why NMD stimulates the proliferative state characteristic of stem cells. “There are many potential clinical ramifications for these findings,” Wilkinson said. “One is that by promoting the stem-like state, NMD may be useful for reprogramming differentiated cells into stem cells more efficiently. Co-authors include Ada Shao, Eleen Y. Shum, Josh L. Espinoza and Rachid Karam, UCSD Department of Reproductive Medicine; and Lulu Huang, Isis Pharmaceuticals. Funding for this research came, in part, from National Institutes of Health (grant GM-58595) and the California Institute for Regenerative Medicine.